So we took a look at the Petron Hand Bow yesterday, and for those who want a little bit more kick in their modern update to medieval weapons, here is the Petron Fun Crossbow. At £14.99 a pop, this lightweight weapon hails from a less civilized age, and will be able to deliver a satisfying twang whenever you opt to let fly a sucker-tipped projectile towards your target. Some assembly is required to piece together this puppy, but it is lightweight enough to let even a 6 year old have plenty of fun with it. 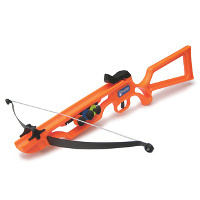 Too bad there are only 3 sucker darts that accompany this crossbow, which means you would most probably spend more time picking up the darts from the floor rather than raining a hail of arrows on your intended target. Best of all is, you do not need the strength required to make use of this compared to an old school crossbow.